I’m not a huge fan of traditional business plan construction but I do acknowledge that the process gives business people a framework for thinking through the various elements of planning for success. Having said that I’m writing this post for another reason. The template that was attached was sent to me by a relationship manager at my Australian bank. I have had virtually nothing to do with him in the past and this came as somewhat as a surprise. He has no idea what my business is about and I’m certain that he sent this template to all his “business” customers. More about those numbers in a minute. I have attached a template to this email on a generic business planning model should you have not drafted one prior. Please feel free to amend and alter as you feel fit to meet your personal and commercial requirements. With any document like this, you may wish to engage your accountant with assistance with financial planning dependable on the lifecycle you entering. As you complete your business review, tax minimisation is generally high on the agenda for most, and as we close in on June 30, conversations with your accountants should be a priority to ensure that the ATO [Australian Tax Office] don’t deduct more than they need to. It may be, some of that aged equipment could be updated to create some leasing costs, or changing the makeup of the structure from a partnership to a Pty Ltd. Again, it comes down to quality conversations with the professionals you engage to assist your business, and ensure you are maximising the advisor portals available to you. There are some things worthy of your attention here. My guess is at least some people who receive this email will think it’s very thoughtful and useful. They may also think “why didn’t my accountant do something like this for me?” Or worse, they may think that their accountant only does taxes – if that’s all you want to do that’s fine, you’ll have no argument from me, but if you want to get into offering higher value services this type of third party pro-activity will not help your cause. Second, he reminds everyone to give attention to tax minimization and personal financial planning as the end of the financial year (in Australia) approaches. Tax minimization strategies are clearly services that you offer but the Bank is very strong in the financial planning arena which leaves the tax stuff with you. He then talks about “quality conversation” which begs the question: do you have quality conversations with your clients? But the context in which he places it in this paragraph leaves no doubt that he’s referring to conversations about tax not about business planning. When you’re talking with your clients, do you really get into their head and work with them on what they could do to realize their potential? I assure you this is not going to be achieved if all you do if ask them for their records and send them a tax return for signing with a schedule of tax payments due… I’m sure you know what I mean. Of course you may have some clients who only want that type of relationship. But they will not be the clients you’re going to grow your business on. At best the revenue growth potential from these people will be whatever your “inflation adjusted fee” is. To grow your business beyond that you’ll need more clients which is always a more expensive form of growth than organic growth. The organic growth of your firm will come from clients who want you to be a growth partner. Someone who will help them achieve their potential. As they grow so will you. More importantly, you’ll find yourself in a position of a relied-upon adviser not just a vendor of professional services. This is a position of relative strength because it means their switching costs are higher. It is a relationship that most other professions don’t enjoy. Clients who have this type of relationship with you will be good referral sources not in the sense of referring hundreds of clients but rather, referring a handful of real quality clients–birds of a feather flock together. If we revisit the survey numbers I shared above my guess is that the people (11%) who never engage in the planning process with their clients have no desire to because they don’t have clients who need it or they just don’t want to do it. My guess is that 11% is on the low side if we looked at the profession as a whole because our list is made up of people who for the most part are interested in practice growth and advisory services. Turning to the 58% who very occasionally engage in planning my strong advice is take a look at your client base and decide which ones you could do some of this work for because you are (1) leaving a lot of potential revenue on the table, and (2) you are quite likely working with many clients who will not be great sources of organic growth (the planners are!) and (3) the more value you add the more you can capture the yield and the opportunity to differentiate your firm in a crowded commodity-based industry is greatly enhanced when you step outside the traditional box – namely 69% of accountants are doing little or none of this type of service. Finally, to the 31% of people who are frequently helping their clients with the planning process I take my hat off. This is where the future lies. These people are proving the point I’m making and that is, business people value these services and are therefore willing to pay for them. The third point in my relationship manager’s note is his reference to “advisor portals available to you.” Some people may not know what that means but they’ll soon realize the amazing amount of free advice you can get from the internet. Just for fun, I Google’d “small business advisor portals” in 0.38 seconds I got 30,500,000 results! Do you have a client portal? Does it contain useful information that will help them run a better business and position you as having domain expertise? or is it simply a handful of calculators (all good by the way) and a bunch of links to the tax offices and your professional organization’s web page. As you clients start to find other sources of advice you are going to find it harder and harder to position yourself as their principal business adviser. This is where cloud-based accounting services are going to present you with an opportunity, if you embrace them, and a major threat, if you don’t. Fifteen years ago I wrote a piece about the emerging competitive landscape in which I predicted the ASP model that was evolving at that time would become mainstream and bandwidth and data storage issues became irrelevant. This is exactly what’s happened although it has taken a little longer than I thought. In that piece I suggested that “s/he who controls the general ledger, controls the relationship.” The cloud makes this possible and in so doing it puts you in the driver’s seat to be providing advice based on reliable, real time numbers that was very difficult to achieve with the traditional client-server architecture that define IT in the past. 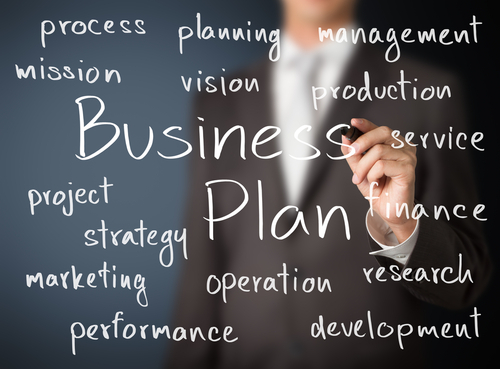 If you want to take a look at the business plan template click here. It’s not too bad and maybe some of your clients might find it useful but if that is the case be a part of the process rather than the party who sent them a document with “good luck” message attached. If you adopt the passive approach there’s a good change the template will get them thinking about the need for a plan, but concluding that it’s not something you want to be part of (otherwise you would have said so!) and they’ll Google “business plan assistance” and they’ll be able to select from 137,000,000 results that popped up when I searched and you might miss the boat…. again.